PHOENIX (AP) — After the shooting death of a rancher, Sens. Jon Kyl and John McCain once again called Monday for National Guard troops to be deployed along Arizona's border with Mexico. The request for 3,000 troops was part of a 10-point plan that also includes hiring 3,000 more Customs and Border Protection agents for Arizona, building new fences along the border and increasing aerial surveillance. The Arizona senators, both Republicans, said in a conference call with reporters that they would introduce federal legislation to implement their plan. Gov. Jan Brewer requested a year ago that President Barack Obama deploy National Guard troops along the border. The senators supported her request at the time, but the Obama administration has not acted. The latest proposal followed the death last month of rancher Rob Krentz on his land north of Douglas. Authorities believe he was fatally shot by an illegal immigrant possibly connected to a drug smuggling cartel. "While we have the nation's attention, it's important that we strike now and we get these suggestions implemented now, because I really feel the window of opportunity will close very quickly," said Cochise County Sheriff Larry Dever, whose office is investigating the killing. 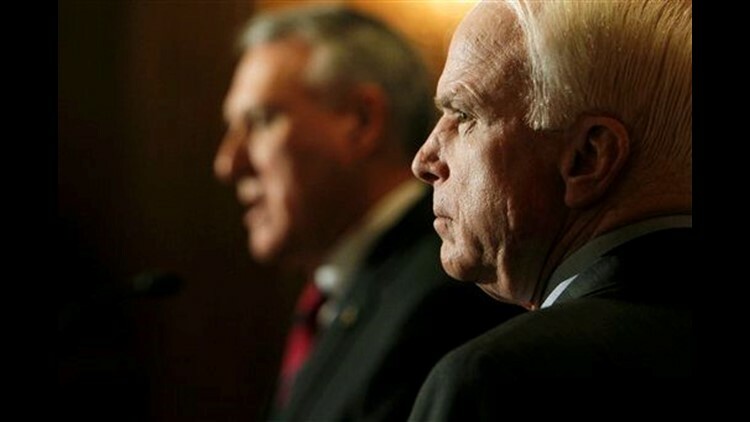 McCain and Kyl also want to expand a program known as Operation Streamline that charges illegal immigrants with low-level crimes and requires them to spend time in jail instead of being immediately deported. Kyl credited the program with reducing illegal immigration along stretches of the border where it's used. Other elements of the plan include calls for more Border Patrol stations in the Tucson Sector, more horse patrols and a full-time federal magistrate in Cochise County. It requests increased funding for programs that reimburse state and local authorities for their costs of detaining illegal immigrants. "The communities in Arizona that suffer the negative impacts from illegal border crossings and the lawlessness along the southern border deserve the full support of the federal government," McCain said. McCain is fighting off a primary challenge from the right. His opponent, former congressman J.D. Hayworth, has accused McCain of not doing enough to secure the border. McCain said the new plan was not politically motivated and defended his record on the issue, saying he's been calling for more border security for years. The senators' plan follows an 18-point plan released by the Arizona Cattle Growers Association, a lobbying group that also called for military deployment. In 2006, President George W. Bush deployed National Guard troops along the border for a two-year assignment building fences, conducting surveillance and performing administrative tasks while recruiting and training new agents.